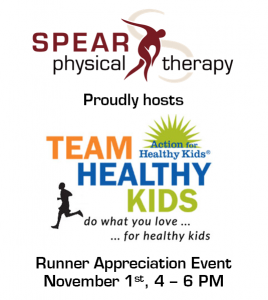 SPEAR to Host Runner Appreciation Event for Action for Healthy Kids To Honor 2014 NYC Marathon Runners! SPEAR Physical Therapy is teaming up with Action for Healthy Kids, a national non-profit organization working to reduce childhood obesity! This year, Action for Healthy Kids has a team of 25 runners running the 2014 NYC Marathon to raise funds for the organization. On November 1st, our Chelsea location will be hosting a Runner Appreciation Event, to honor the team of runners, named “Team Healthy Kids,” along with their families. In addition to providing our beautiful Chelsea space for the evening, SPEAR will also provide body taping for the Team Healthy Kids marathoners, during and following the Marathon on November 2nd! We are proud and excited to honor these marathoners for their months of dedication and fundraising, and couldn’t be more excited to partner with an organization that helps children get back to life!